Folding England chair with cup holder. Perfect England World Cup supporters accessory that is necessary and practical for England football supporters to do their job in comfort and style. 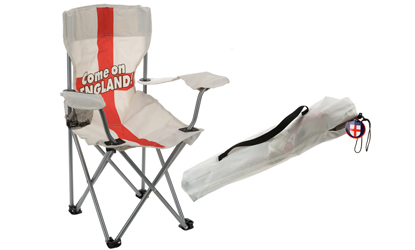 If your planning following the England team to show support, the folding England chair would be ideal to bring. Light weight and easily carried, you can relax in the sun and support England. The folding England chair even has a can holder in the arm. And for when its not the world cup, but your man thinks it is, you could take it to watch his football matches or support your child as he plays with his team. Light weight folding England chair is perfect for sitting at ease at picnics, outdoor evens and festivals. With its own handy carry bag, this folding England camping chair set means that you can enjoy your outdoor events in comfort.